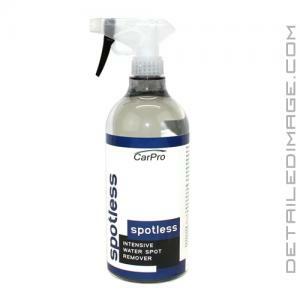 CarPro Spotless Water Spot & Mineral Remover chemically breaks down mineral deposits left behind by water spots before they can etch into your finish! Unfortunately when these many water spots actually lightly etch in to the surface they can be incredibly frustrating and time consuming to remove. The traditional option for removal is to polish that area, starting with a less aggressive polish to a stronger one. There have however been many advances in technology that allow us to save much needed time and energy, while still removing these spots without polishing! Spotless is packed with a special blend of carefully balanced gentle acids, that safely remove heavy mineral deposits on most vehicle surfaces. Simply spray this product onto the surface and using some elbow grease, work the product over the water spots. You will be amazed at how quickly and easily the spots disappear without having to polish your entire car! If you are looking for a fast and efficient water spot remover, the CarPro Spotless Water Spot & Mineral Remover is the solution to your problems! I have been very pleased with the Spotless product. I have had great success removing light to moderate surface water spots very quickly and easily. This product can be used on paint, glass, chrome, and plastic. This is a much needed product, as hard water spots are inevitable for most vehicles, and if they are not removed in a timely manner they can lead to much more severe damage. Will not affect hydrophobic properties. Use on paint, glass, chrome & plastic. Spray over the surface, work in the solution with a sponge. Wipe off with MF, rinse with water. Repeat steps 1.2.3. if necessary. Works very good on clear coat. Not so much on glass. Brought it to remove water spots on my windows, doesn't really work. But since I have a whole bottle of spotless might as well try it on the paint, it works amazingly well. I guess this product was design to remove water spots from paint so it's not strong enough for glass. Easy to use just spray it on the paint rub it a little with an applicator then rinse off, and water spots are gone, it makes life so much easier don't have to repolish the whole panel. Seems to work just as described, but you MUST rinse with water after application. Otherwise, there will be smearing, especially on glass. I failed to read the instructions carefully and that is what happened to me. This works very well to remove water spots from paint that has been ceramic coated. It removes the mineral ring as well. It may take a couple applications to fully remove them. It can mask the properties of the of the ceramic coating but that is revived with a wash CarPro Reset. It will remove or weaken a wax or sealant and I would recommend reapplying a fresh coat of wax or sealant.